MERRY CHRISTMAS! MAY YOUR HOLIDAY SEASON FILLED WITH LOVE, JOY AND PEACE! This is one of the new holiday cookies I tried this year for Christmas holiday. The other ones are thumbprint cookies and meringue coconut crunch. 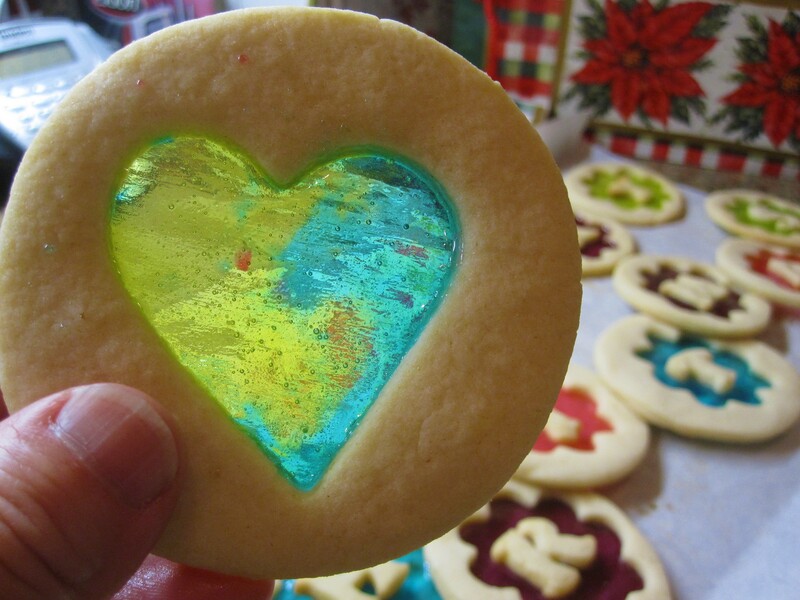 Back to these attractive colorful stained glass cookies… Aren’t they beautiful? They are of different flavors too depending on the candy flavor. And these stained glasses didn’t last long– kids just love them! To be honest, I’m not a fan of cut-out sugar cookies with icing and sprinkles on top, too plain sweet for me. So I never make it for the holiday (hey, baker chooses what to bake you know ;-)). But for these stained glass I can do it, if not for its taste at least for its look! So this cookie is officially on our Christmas cookies list. This is a very simple recipe. The dough can be prepared ahead of time. The most challenging part I guess would be crushing the hard candies– never underestimate the power of hard candies! Many people made a mess of candies flying everywhere… For me, I just let the man of the house do it, on the floor (unless you want to risk breaking your table/kitchen counter). Kids will have fun helping you out cutting the dough and sprinkling the crushed candies. Be creative with the colors and patterns, but take care not to mix too many colors or it will be messing looking glass. Have fun! 15-20 hard candies (Life Savers or Jolly Ranchers)– separate flavors into different groups, then crush separately with a hammer. Cream butter with a hand mixer until light, add sugar and cream until fluffy. Add egg, mix to blend well. Add vanilla extract, mix well again. Combine flour and salt. Use a spatula or wooden spoon, mix flour mixture into butter mixture in 2-3 batches. Use mix and pad down motion, until all dry flours are incorporated and form a dough. Divide dough in half. Flatten each half to a disc, wrap tightly and refrigerate overnight. Bring dough to room temperature, roll out to 1/4 thickness (I rolled mine even slightly thinner than 1/4″). 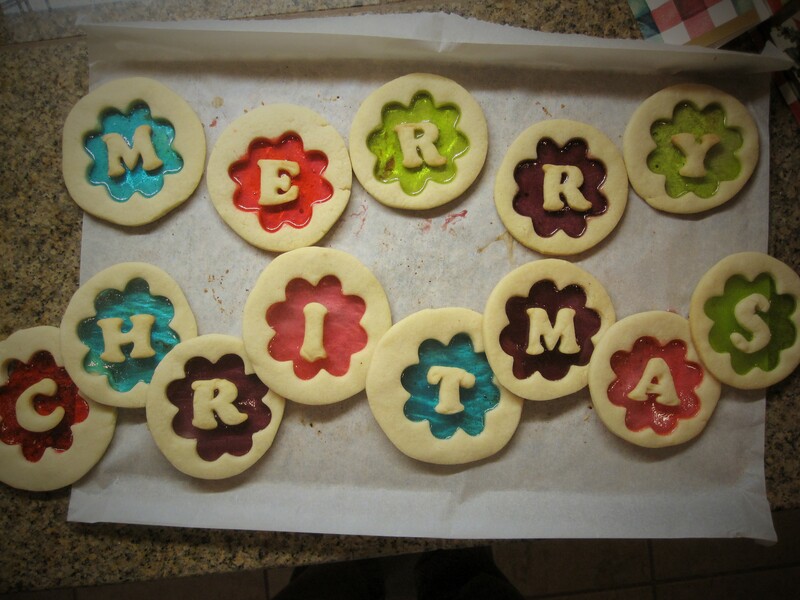 Dip cookie cutters in flour then cut out dough– you will need cookie cutters of larger and smaller sizes. Make sure the smaller cookie cutters fit into larger cookie cutter. The idea is to cut out cookie dough for the outer side of the cookie, leaving out the center of the cookie for the stained glass. To do so, use larger cookie cutters to cut out the dough first, transfer cut dough onto baking pan, then use the smaller cookie cutters to cut out the middle part, leaving the center of the cookies hollow. 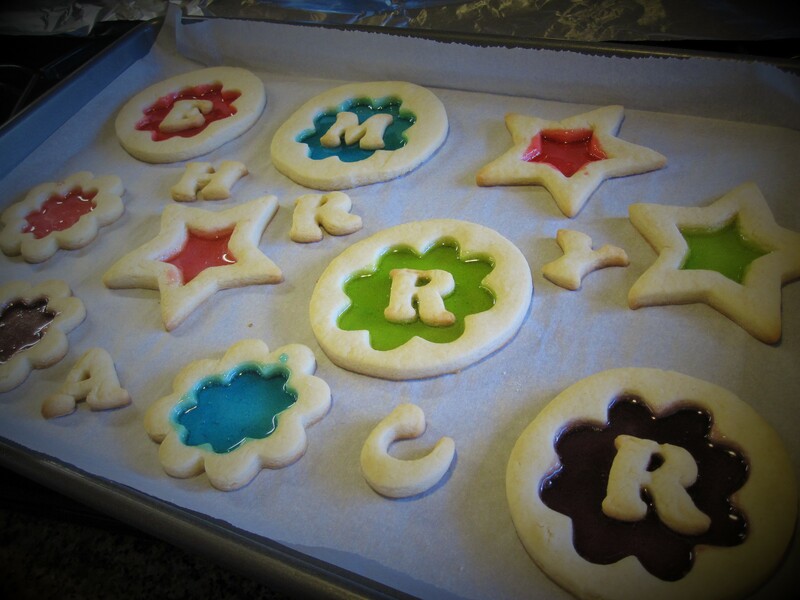 If you have small alphabet cookie cutters, you can use them too to create name initial stained glass cookies. Arrange cookies about 1 inch apart on baking pan, bake for 6 minutes, or until the bottom is slightly brown. Remove from the oven but maintain oven temperature. Carefully spoon (1/2 to 1 tsp) some crushed candies into the middle hole of cookies. If the candies touches the cookies, quickly use your finger to sweep it to the middle hole. You can use 1 color/flavor, or use 2-3 colors/flavors for one cookie, depending how big the middle hole is. Do not mix colors/flavors all together as it will create messy looking stained glass. Return to the oven for 2-3 minutes to melt the candies. Remove from the oven. If you are using letters for the cookies, quickly place an alphabet cookie in the center of melted candy. Cool cookies on the pan for 5 minutes for the candies to set. Peel off cookies from parchment paper and continue cooling on a rack. Store in air tight container when cookies are cooled completely. Crushing hard candies: To prevent candy explosion, keep candy wrappers on, wrap with paper towels and place inside a ziplog bag. Take out the candy wrappers after it is crushed. Crushing candy is very loud with all that hammer actions, so I suggest crushing it on a wooden surface on the floor. Do not do it on your kitchen counter unless you are ready to replace with new counter top. And remember, crush each flavor group separately. Not enough candy to cover the middle hole: After the last 2-3 minutes in the oven and if you find not enough candy to melt and cover the entire middle hole, just add in a bit more crushed candies to cover up, bake for another 1-2 minutes. Keep an eyes on the melting process. Do not over melt the candy: Keep a close eye on the melting process. Once the candy melts it gets bubbly fast– which will create a smeared edge between candy and the cookie itself, not to mention chance of melting candy overflowing to the cookie part. The other thing is that when candy get bubbly hot it creates air bubbles. These small air bubbles, when cooled, trap inside the candy and will affect the smooth clear clean stained glass look. To get rid of air bubbles, use a toothpick to swirl around the melted candy while it is still hot out from the oven. The melted candy sets quick so you have to swirl around fast. The best stage is when the candy just melts, no bubbles at all.